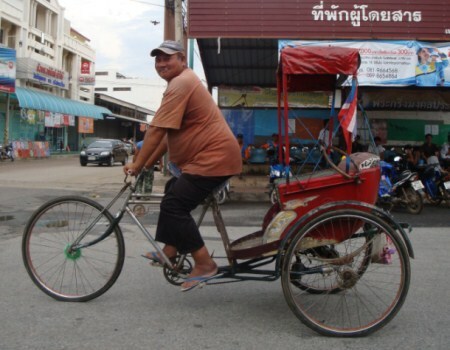 In Phimai town you will see trishaws plying their trade. The Thai word for trishaw is sam lor (สามล้อ) which means ‘three wheels’. Trishaws are pedal powered three wheeled cycles in which the customers sit in the back and the trishaw driver pedals the trishaw around the town. I am told that a typical price for a route in Phimai town is about 10 baht.